While pre-season expectations targeted a mid-table finish for Dinamo Moscow, preparation was a nightmare and the season so far has been a disappointment. Reported disagreements between sporting director Roman Shirokov and manager Dimitri Khokhlov severely harmed the club in the transfer market. Only two transfers were added in the summer, wingers Joaozinho from Krasnodar and Miguel Cardoso from Portuguese club Tondela. This has left the club with a perilously thin squad following summer departures and has contributed to the disappointing season so far. However, the club’s fans have firmly taken the side of their former playing hero Khokhlov in the reported disputes with Shirokov. Thus meaning despite the season so far that Khokhlov’s position barring a shocking downturn in results should be safe. Encouraging signs have been present throughout the season despite the inconsistencies, such as a 1-0 victory over Zenit highlighting that Dinamo have the potential to climb up the standings in the New Year. Positives: Fears were raised in the summer when last season’s star man Aleksandr Tashaev departed for rivals Spartak, however, in the aforementioned Cardoso and Joaozinho, the club have found more than adequate replacements for Tashaev. With just 13 goals conceded, Dinamo have looked resolute defensively so far, only being overrun just once in a 3-0 away loss to Krasnodar. The aforementioned victory over Zenit was a deserved one and another source of encouragement for both Khokhlov and Dinamo has been a decent amount of playing time for youth academy graduates Vladimir Moskvichyov and Roman Yevgenev so far this season. Negatives: Inconsistencies have plagued Dinamo all season. Shock home losses to relegation-threatened Enisey and Anzhi were very disappointing, especially considering how strong Dinamo normally are at the Khimki. Finally, goalscoring is a major problem for the team with only 16 goals scored in 17 games so far. The top scorer for the team four players who have each scored two goals, highlighting the need for a new striker if possible in the January transfer window. Grade: 5/10 – A disappointing season so far from the Muscovite Blue-Whites, however, there are signs of optimism for Dinamo going into the new year. Whilst Dinamo have not won many games, they have also not lost too many either with the major problem being too many draws. A 4-0 home win before the winter break against Ural was the club’s last game at Arena Khimki before they move into their new stadium in the spring. The new stadium boost could therefore act as a catalyst for a revival of the club’s fortunes in 2019. For FNL clubs, establishing themselves in Russia’s top flight is extremely difficult and so far this has proven true for Siberian outfit Enisey. Despite an impressive recruitment campaign in the summer which included several signings from the now defunct Amkar Perm and the presence of manager Dimitri Alenichev, formerly manager of Spartak, Enisey have found the step up to the RPL very difficult. 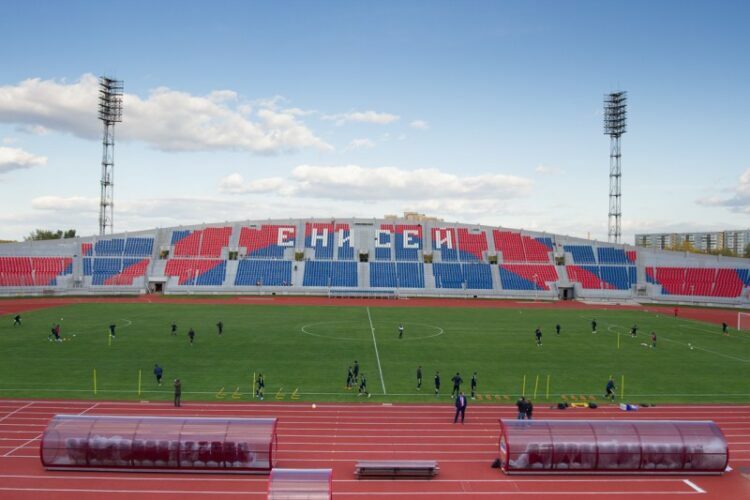 Admittedly, what has not helped the Siberians was the inability to play their first four home games this season in their home city of Krasnoyarsk due to their home stadium needing renovations to meet RPL standards. Nonetheless, Enisey’s position looks perilous at the bottom: only two wins all season against Krylia and Dinamo Moscow, 10 points on the board from 17 games so far and six points away from Ufa in the promotion/relegation playoff 14th place. It would be a miracle if the Siberians were to survive. Positives: The highlight of a difficult season so far is without question the 2-1 shock away win against Dinamo Moscow which briefly resurrected hope of a survival bid for the Siberians. Also encouragingly, the Siberians have improved in recent weeks, only narrowly missing out on another home win against Akhmat and were on the wrong side of a narrow 2-1 away defeat to CSKA in the last game before the break. Negatives: The defence, 28 goals conceded in 17 games is the joint worse in the league and will need improvement if Enisey are to have any chance of staying up. Equally worrying ins the lack of goals. Just 11 goals scored in 17 games with none of the strikers on the club’s books looking RPL quality. Finally, a tough run in with daunting away trips to the likes of Lokomotiv, Spartak and Zenit yield little hope for Enisey in their bid to survive. Grade: 4/10 – Despite a decent summer transfer wise, Enisey have still looked hopelessly outclassed in the RPL. Alenichev oversaw this summer recruitment, yet Enisey look far behing fellow promoted sides Krylia and Orenburg so far in the RPL. On the evidence so far, barring a big improvement, survival looks impossible for Enisey. Krasnodar entered this season with a large amount of uncertainty, mostly because of key personnel losses. During the offseason, the Bulls lost their star striker Fedor Smolov, who many considered to be the best striker in the RPL. They also lost club legend and captain Andreas Granquist, who returned to his native Sweden to finish his playing career. Additionally, the Bulls entered the year with a 33-year-old manager, who had never before managed a professional team. Given these challenges, many felt that the Bulls might take a step back from their 4th place finish of a year ago. However, things could not have gone more differently. Krasnodar currently sit 2nd in the league table, one point off of leaders Zenit and with a three-point drop to CSKA Moscow below them. The Bulls have managed to balance successful performance in the RFPL with performing in the Europa League, where they finished second in their group to qualify for the round of 32, where they will face Bayer Leverkusen. Not only have Krasnodar performed well in terms of results, but they have played the most scintillating football in the RPL this season. Manager Murad Musaev has Krasnodar playing their trademark attacking, fast-paced football at a high level. They lead the league in scoring with 31 goals, with Zenit being the next closest team with 27. The Bulls have replaced Smolov’s prolific goal-scoring with a committee approach, as five players have scored four or more goals in the league this season. Musaev has also done a fantastic job of integrating academy players into the first team, which is surely helped by the fact that he was the manager of Krasnodar’s U21 team before taking over the reins for the first team. Under his brief tenure, two academy players, Daniil Utkin and Artem Golubev, have made first team debuts, while Matvei Safonov, Ivan Ignatiev, and Magomed Shapi-Suleimanov have all seen their roles in the first team grow. Shapi and Ignatiev in particular have become important first team players, as the pair have combined for 12 goals for the first team this year. Positives: The Highlight of Krasnodar’s season so far has to be their 2-1 win over Sevilla courtesy of an 87th-minute bicycle kick. Also impressive have been their 2-1 wins over both CSKA and Lokomotiv Moscow, two contenders for Champions League places. Krasnodar also must be happy that the production line from their academy seems to be in full swing, with a talented crop of young players beginning to make a serious impact on the first team. Negatives: If there is a bone to pick about Krasnodar’s start to the season, it is the performance of their defence. While their 13 goals allowed is joint third best in the league, new centre-back Uros Spajic has looked shaky at best and has been exposed in European competition. Depth at the back is also a serious concern, as backup Jon Gudni Fjoluson’s disastrous game against Sevilla showed that he simply isn’t good enough to play for Krasnodar. Grade: 9/10 – Krasnodar has to be thrilled with their progress so far this season, and have managed to stay true to their attacking football philosophy while at the same time achieving results. The Bulls have to be considered one of the main contenders for the RPL title this season. 2017/18 saw Lokomotiv, who were tipped by nearly everyone to finish no higher than 5th in the table claim a surprising and well deserved 3rd Russian title win. 2018/19 for the Railroaders can be described so far using the phrase “What a difference a year makes”. All season, Lokomotiv, due to inconsistent results, have looked a shadow of their imperious selves last season where veteran coach Yuri Semin helped inspire them to the famous title triumph. Key personnel from last season’s title triumph such as Igor Denisov, Manuel Fernandes and Solomon Kverkvelia have also struggled to replicate their high level performances of last year. Loko’s return to the Champions League for the first time since the 2005/06 season was also a disaster, drawn in a not too imperious group containing Schalke, Porto and Galatasaray, Loko managed just a solitary win in six games finishing bottom of their group and failing to even secure a Europa League place post-Christmas. Another disappointing part of Loko’s season has so far been poor summer recruitment. Fedor Smolov began 2018 as Russian football’s star man amid links of a transfer to English club West Ham. He ends it no longer in the Sbornaya’s starting eleven after flopping at the World Cup and having failed to make a mark at Loko after his summer transfer from Krasnodar. Veteran German World Cup winner Benedikt Howedes has also been a huge disappointment since signing from Schalke in the summer. To compound Loko’s misery further, the winter break has seen more issues at the club as both Director General Ilya Gerkus and sporting director Erik Stoffelshaus have both left their roles at the clubs. Yet, despite all the gloom, Loko due to leaders Zenit’s horrible recent form remain only six points behind in the RPL table. Thus still having a chance to achieve their pre-season objective of qualifying for next season’s Champions League. Furthermore, after a 1-0 victory in the first leg of their Russian Cup Quarter Final against Rubin, Loko are in with a good chance of once again winning the Russian Cup and salvaging a so far poor season after the winter break. Positives: Loko are progressing nicely in the Russian Cup after victories over Baltika and Enisey and have a chance once again of achieving success in this competition. In a challenging season, Anton Miranchuk, so far Loko’s top scorer with four goals in the league and three goals in the Russian Cup has so far outshone his more famous brother Aleksei. Finally, the situation whilst poor at the moment is not beyond retrieval in the league with regards to Champions League qualification. Negatives: Where do you start, Loko’s old brigade such as Fernandes and Denisov have declined massively this season. Poor performances both domestically and in Europe. Disappointing summer recruitment and turmoil behind the scenes with the resignations of both Gerkus and Stoffeslhaus. Grade: 5/10 – Only a good performance in the Russian Cup salvages Loko’s seasons so far. However, Loko are only six points off Zenit in the league despite the turmoil and can still turn their season around, securing Champions League qualification with a top three finish and a Russian Cup victory would represent a job well done for Semin. Especially as Loko transition from replacing their ageing fading stars such as Fernandes and Denisov.